Thursday night a hip crowd of gallery spectators mixed and mingled amongst each other at the private preview party for the DIY or Die! exhibit that opens today at Milk Studios. The place was packed with a large assortment of characters– hipsters, Wall Street, fashionistas (some I’ve bumped into at Fashion Week), and skaters alike filled the room. Many stepped up their fashion A-game for the gallery opening night. Each person was interested in the punk to reggae vibe that the DIY or Die! exhibit was celebrating; the thumping DJ beats + open bar didn’t hurt either. The exhibition was a collection of record covers, fanzines, and posters that stand as a true testimony to the punk rock culture of “making it work” (thanks, Tim Gunn! ), even if money is sparse. Bands would get friends and family to help put together their album covers. The blank canvas of a record sleeve had endless opportunities to be personalized and gave an opportunity to share their own individual voice to fans and the public. The show had pieces ranging from the late 1960’s when the punk scene exploded in New York’s gritty downtown, to present day art, curated by Johan Kugelberg, founder of Boo Hooray. It is a great show and was a unique, very New York experience! Click through the slideshow to see the party pics for yourself. 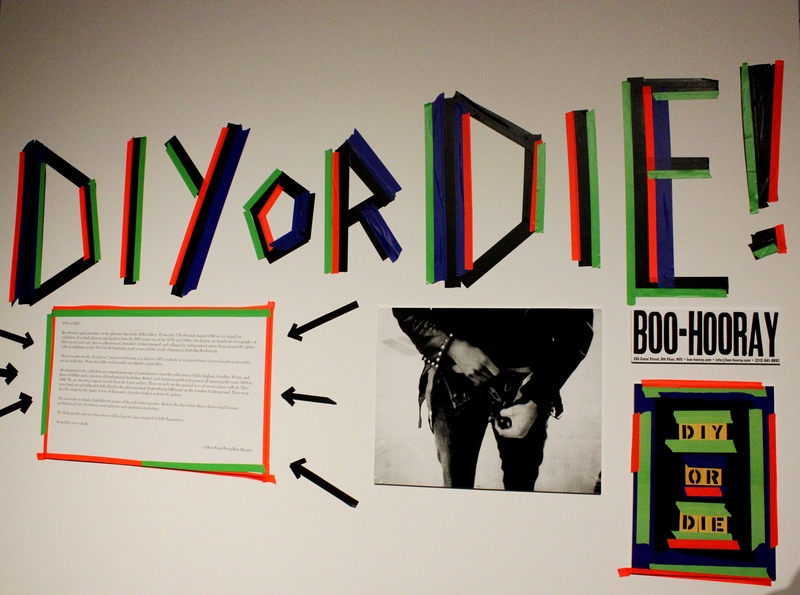 Pop in and check out DIY or DIE! HANDMADE ZINES, RECORD COVERS AND POSTERS FROM PUNK TO REGGAE on display at Milk Gallery from July 17 through August 10. After you go, stop by The Tippler for a sweet libation– it’s right across the street!